The music is soft and appropriate to the theme of the slot game. Winning combinations use cinematic clips instead of animated graphics. However there are no dialogues or audio from the movies in these clips. There are different animations for the Ring symbol and this increases the anticipation. The Eye of Sauron spewing fire and expanding to fill all three rows is an awesome sight. FOTR has 243 paylines. This means that if like symbols appear in successive reels in any position starting from the left most reel a winning combination can ensue. All 243 paylines are automatically active. 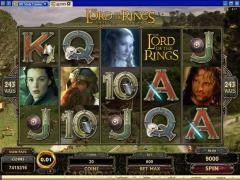 The player can wager up to 20 coins per payline. The number of coins selected determines the line payouts. The total number of coins per spin is 30 times the number of coins selected per payline. The scatter payouts are based on the total number of coins. The coin size can be selected from three options that are 0.01, 0.02 and 0.05. The maximum number of coins that can be won in a given spin is 1,900,000. 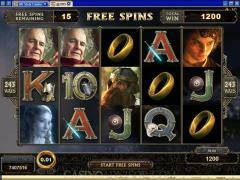 A new feature introduced by Microgaming in the FOTR slot game is the Cinematic Spins. In this feature the reels disappear for a while after the spin is activated and players can see clips from the movie in the background. Some of the popular scenes are Ringwraiths during the attack at Weathertop, Balrog in the Mines of Moria and Uruk-hai in the woods of Middle-earth. The Lord of the Rings Logo is the wild symbol. It does not provide line payouts but appears stacked both in the base game and the free spins. Two or more Ring scatter symbols appearing anywhere on the reels lead to scatter payouts. 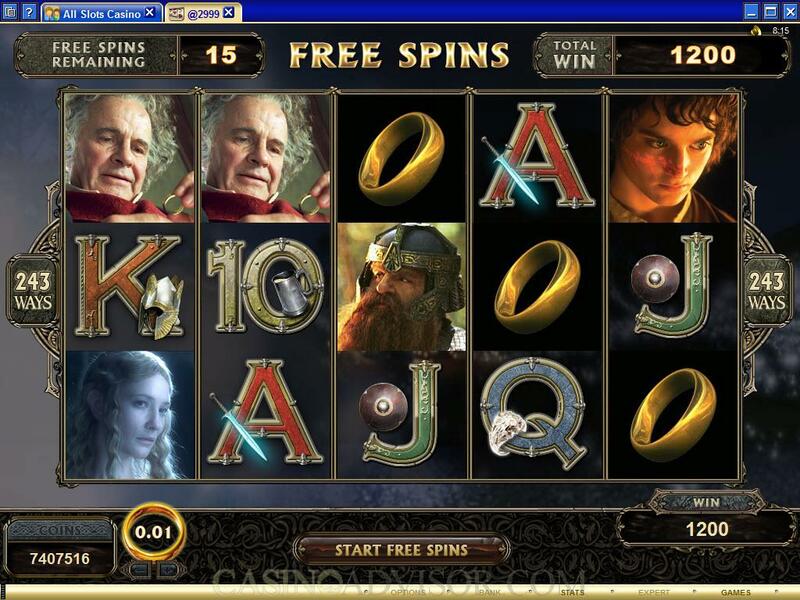 If three or more Ring symbols appear on the reels then the free spins are triggered. 15 free spins are offered and on each spin a randomly chosen reel is turned into wilds. The free spins can be retriggered. The Eye of Sauron is the bonus symbol. It does not trigger any bonus game on the second screen but leads to additional payout possibilities in a unique way. It can appear anywhere on Reel 3 and can expand to make the entire reel wild if there are possible winning combinations. However, this happens only in the base game and not in the free spins. 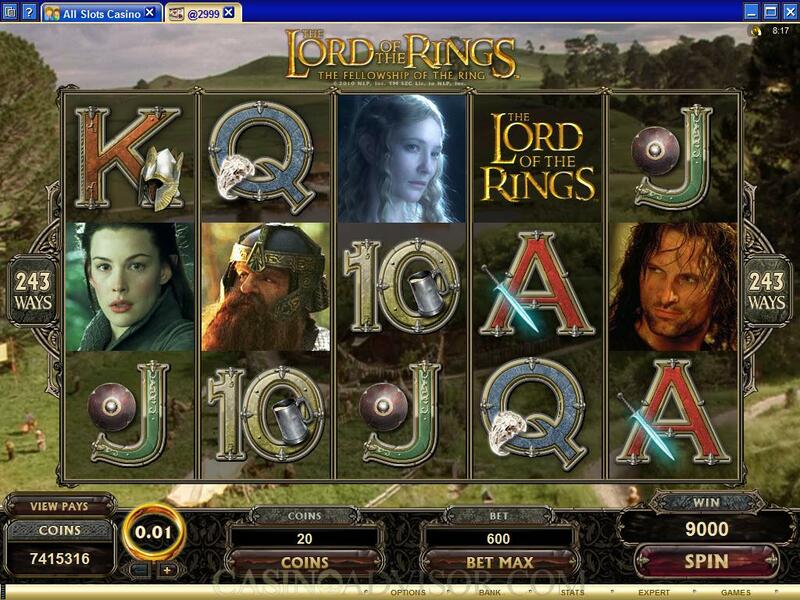 FOTR does not offer the trademark Microgaming gamble game, nor does it offer any progressive jackpot. Interested in reading more detailed information about Lord of the Rings Fellowship of the Rings? If so Click Here for more details.